One of the more significant achievements of Joao Havelange’s time in charge of FIFA was to turn the organisation into a financial powerhouse, through merchandising of the World Cup name. The 1982 tournament saw the introduction of corporate sponsorship and the beginning of its conversion into the biggest sporting event on the planet. In the midst of all of this commercialism came one – at the time, relatively minor – piece of licensing that would provide a fascinating insight into how not to handle a crisis. Video gaming had started to become fashionable during the late 1970s and by the middle of the following decade it had become big business, making millionaires of some and ruining others. It was, perhaps, inevitable that the World Cup would be picked up on as a tournament that would fit in with the rush to make money within this particular industry, and FIFA licensed the sale of the official rights for a game for the tournament in 1986. 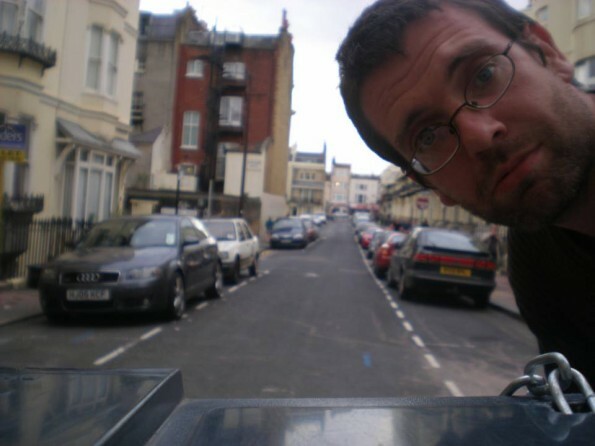 The company that won the rights to produce the game was a Birmingham-based company called US Gold, who had been formed three years earlier with the intention of porting versions of popular games to the ZX Spectrum from other machines such as the Commodore 64, but had in the intervening years found itself a niche in the market converting arcade games and big name licenses for use on the rash of inexpensive home computers that had become popular across the world during the mid-1980s. US Gold acquired the rights to the World Cup in 1985, giving it a full year to get its game worked out. As time progressed, however, the project to write a game that would revolutionise football gaming on home computers became mired in problems, and as 1986 begun the company had to face an unpalatable truth – their game would be nowhere near ready for commercial release by the start of the tournament in June of 1986. Faced with the possibility of not having a game to release at all by the time of the tournament, US Gold resorted to an action that would go down in infamy within the gaming industry ever since. They licensed another, older game, added some bells and whistles and released it anyway. The game that they chose to use was Arctic Software’s World Cup Football, which had been released two years – an eternity at the then crucible-like rate of change of the first years of video game development – earlier, with no great fanfare and not to particularly great reviews. A “training mode” of penalty shoot-out and ball-juggling games (which bore no relevance to the actual game play and, as such, could hardly be described as a “training mode” at all) were tacked onto it, a few souvenir extras were thrown in, and the game was pushed out for sale at the – by the standards of the time – premium price of £9.95. The press reaction to the game was predictably derisory. Crash magazine, one leading publication for the reviewing of ZX Spectrum, gave the game a score of 26% and noted, “nice freebies, shame about the two year old recycled game”, whilst its sister publication for the Commodore 64, Zzap 64, reviewed the game with a score of just 11%, Your Sinclair magazine asked whether “Maybe US Gold should go in for the souvenir market full time”, and even the normally staid Sinclair User magazine described it as “mutton dressed as lamb”. There were reports that US Gold staff had been instructed not to speak to journalists or the public on the phone and magazines were flooded with letters of complaint from buyers. For all the bells and whistles, the hints were there that there was a major problem with the game. To house all of the bits and pieces that the game came with, it came in a huge box, the size of a video cassette case, yet there were no screenshots from in game play on either the front or the back of the box and, if one looked very carefully at the cassette upon which the game was recorded, the big giveaway of all was written in black and white – “© 1984 US Gold”. It sold well, of course (officially licensed versions have always sold well, which is no small part of the reason why the official licensing of video games has become such big business), but US Gold was being attacked from all angles by now. The company’s official response came with an official letter a couple of months later. 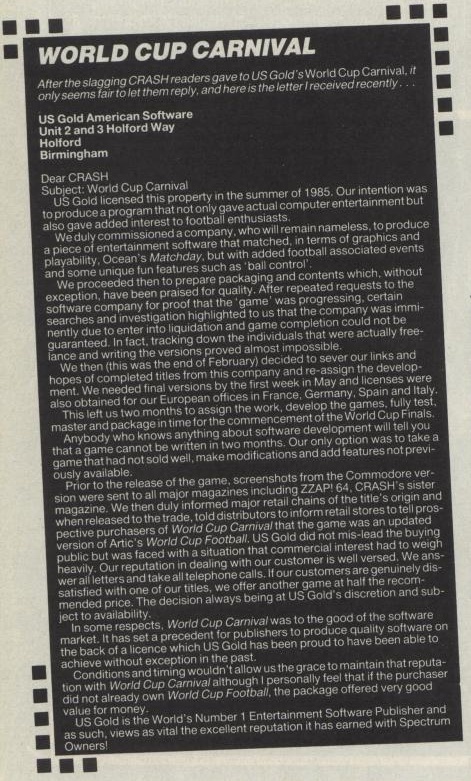 “In some respects, World Cup Carnival was to the good of the software market”, they wrote, “It has set a precedent for publishers to produce quality software on the back of a license which US Gold is proud to have been able to achieve without exception in the past”. Such words, however, were not worth a great deal to those that had lost a significant amount of money – as £9.95 was in 1986 – and there can be little doubt that US Gold’s reputation suffered enormously for this sequence of events. A typical response to their open letter can be seen here. The company survived until into the 1990s, but for some a bond of trust had been lost, and the suspicion of officially licensed titles remains for some gamers as much as a quarter of a century on.